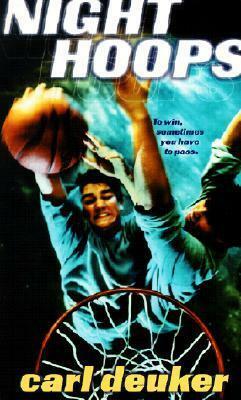 Carl Deuker's Official Website - NIGHT HOOPS--WINNER 2003 GOLDEN SOWER AWARD (NEBRASKA) FOR YOUNG ADULT BOOK OF THE YEAR. 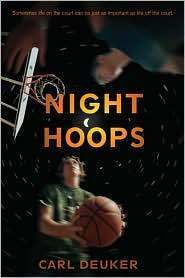 NIGHT HOOPS--WINNER 2003 GOLDEN SOWER AWARD (NEBRASKA) FOR YOUNG ADULT BOOK OF THE YEAR. To buy Night Hoops, please click here. I could hear him breathing, long deep breaths of relief, the gray-white vapor showing against the darkness of the night. One deep breath and then another. "Trent," I said, "what happened?" Another pause, and then his voice: "It's crazy. We've had the gun for years, hidden away in a closet. We always talked about going down to the trail some night and shooting into the water, or at a tree or something, but we never had any bullets. That's what Zack was showing me last night--that he'd gotten the bullets. When I wouldn't go with him, he went down there alone. Michael was standing on the bridge, the way he does, and Zack just sort of waved the gun at him. . ."
All Nick Abbott ever wanted was for his father to compliment his game. That praise has always been reserved for Nick's older brother, Scott, a gifted athlete. When Scott chooses music over basketball, Nick finally gains his father's attention-and his win at all costs mentality. As one of only three sophomores to make varsity basketball, Nick struggles with becoming a team player, especially when that means sharing the ball with Trent Dawson, the troubled but talented boy from across the street. Then Nick's mother tells Trent that he can practice using Nick's backyard hoop. As Nick and Trent begin to play pick-up games late into the night, they also, reluctantly, begin to form an unusual friendship, and learn that how you play matters just as much as winning.